We are gaining great traction over at the Center for Carbon Removal. Make sure to check out our blog and follow us on Twitter @CarbonRemoval, and continue the carbon removal conversation there! Exciting blog news: Everything and the Carbon Sink is Moving to the Center for Carbon Removal! It is with great pleasure that I announce that this blog will be moving to the Center for Carbon Removal at: http://www.centerforcarbonremoval.org/blog! The Center for Carbon Removal is a new environmental NGO dedicated to accelerating the development of carbon removal solutions (many of which have been featured here on this blog!). Carbon-removing farms, energy systems, buildings, and manufacturing facilities — among many others — hold enormous potential to transform the global economy to be more sustainable. The Center for Carbon Removal is a first-of-its-kind effort to unlock this potential through research and analysis, event organization, and information/communication campaigns focusing on carbon removal solutions. My posting frequency has been slower than I’d like over the past few months as I’ve worked with an amazing team of advisers and partners to get the Center ready for launch, but our team at the Center plans to post content with greater frequency on the new site. What’s more, out website (www.centerforcarbonremoval.org) aims to provide our community with a growing range of tools to continue the dialogue on carbon removal, discover new information about promising carbon removal solutions, and share information with other communities that are passionate about sustainability, fighting climate change, and cleantech entrepreneurship. So please check out our new site, give us feedback and engage in conversation, share resources you think are useful, and help us grow our community by spreading the word on carbon removal via Twitter (@CarbonRemoval) and Facebook! Preventing catastrophic climate change is a moral and economic imperative. Preventing catastrophic climate change requires that we limit the global mean temperature increase to 2 degrees C from pre-industrial levels. A portfolio of traditional greenhouse gas mitigation measures (renewable energy, energy efficiency, avoided deforestation, etc.) and a portfolio of gigatonne-scale carbon removal solutions (both biological and chemical) are necessary to limit temperature increases to 2 degrees C if we also want to avoid geoengineering. 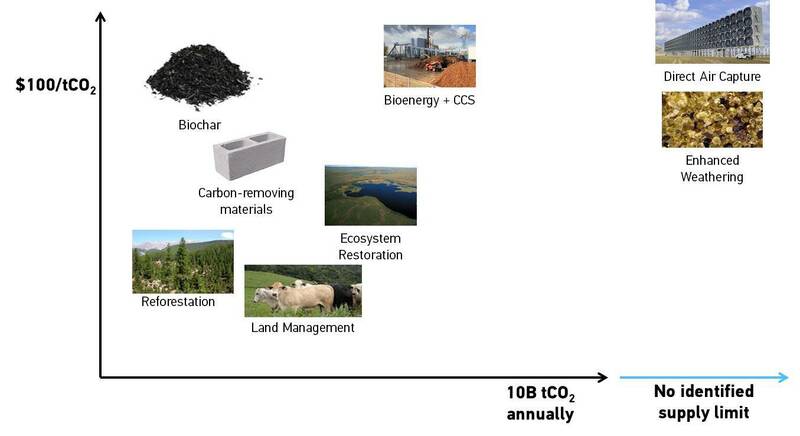 In the future, the portfolio of large-scale carbon removal solutions will include: re/afforestation, ecosystem restoration, carbon sequestering agriculture, biochar, bioenergy with carbon capture and sequestration, direct air/seawater capture and sequestration, mineral weatherization, “blue carbon” strategies, and likely other techniques not yet proposed/published. Geoengineering is worth avoiding, as its risks outweigh its potential benefits. Developing sustainable and economically-viable carbon removal solutions will require significant investments in research and development. Once developed, commercializing promising carbon removal solutions will require the development of markets that demand carbon removal — carbon removal as a co-benefit alone will not be enough to reach gigatonne scale removal levels. In order to catalyze development of carbon removal technologies and markets, leaders from industry, policy, NGOs, philanthropies and the general public need to engage in dialogues about the best ways to develop carbon removal solutions — information and discussion is needed before effective action occurs. Armed with information about the opportunities and challenges of carbon removal, a broad coalition of business and environmental interests will emerge to support the development of carbon removal solutions — no entrenched interest gains from keeping carbon in the air, so no entrenched interests have an economic incentive to fight the development of carbon removal solutions. Opponents to carbon removal will mostly object to the specifics of how carbon removal is accomplished/implemented, not to the overall need for carbon removal to fight climate change. The few opponents that do object to carbon removal writ large will do so on grounds that A) carbon removal will lead to a moral hazard that delays action to reduce emissions and/or B) carbon removal solutions are too expensive and slow working to implement at scale. Carbon removal solutions will not lead to moral hazard around reducing emissions, as carbon removal solutions will not develop quickly enough for companies to continue emissions at large scale so long as they remove more than they emit, rendering the moral hazard argument largely a distraction. Today, there is growing bipartisan support for governments across the world to price carbon emissions. Moving from theory to practice, however, has proven challenging, as the two leading approaches to pricing carbon, carbon taxes and cap-and-trade programs, only cover about 12% of all carbon emissions globally today. 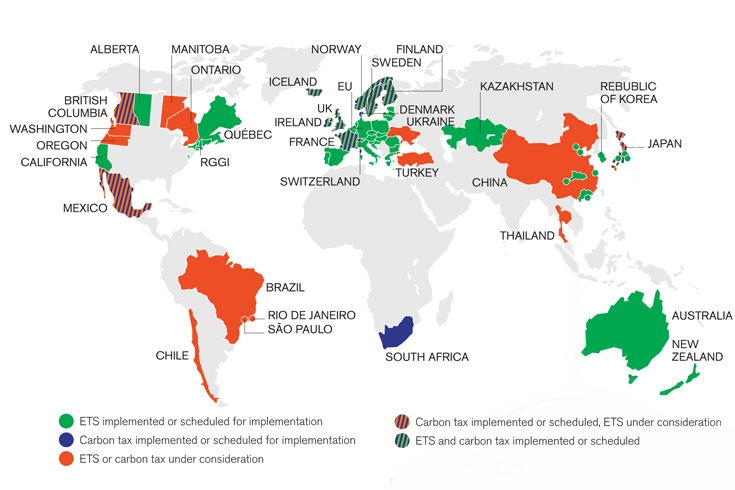 Above: the World Bank State & Trends Report Charts Global Growth of Carbon Pricing — many jurisdictions are considering carbon pricing programs, but only a fraction of all emissions are currently covered under existing regulations. Besides carbon taxes and cap-and-trade programs, few other approaches to carbon pricing have been proposed. But the development of carbon removal solutions – i.e. processes that remove and sequester carbon from the atmosphere – could provide an opportunity for a new type of “pre-pay” carbon pricing system that avoids many of the pitfalls of today’s carbon pricing proposals. A “pre-pay” carbon policy might work something like this: before a company extracts a ton of carbon from the ground (be it in the form of oil, natural gas, coal, trees, soil, etc. ), it would have to “pre-pay” for a credit demonstrating that the organization (or a third-party) had already removed and sequestered an equivalent ton of carbon from the atmosphere. Accompanied by an open commodity market for such “carbon removal credits,” companies would be able to comply with this policy in an economically efficient manner. A “pre-pay” carbon pricing policy would have many benefits compared to carbon taxes and cap-and-trade policies. For one, “pre-pay” systems are intuitively fair. If a company removes an equal quantity of a pollutant that it intends to emit before it actually creates that pollution, then the company can make a strong case it is doing no harm to the environment on net. Second, a “pre-pay” policy would be administratively simple. Unlike existing cap-and-trade program designs, a “pre-pay” system has no need for setting rules about allocating emission allowances, banking/borrowing of allowances, and the use of offsets. Third, a “pre-pay” system provides a political middle ground that enables both fossil energy and environmental advocates to achieve their goals, as a “pre-pay” policy would neither kill fossil energy nor enable business-as-usual when it comes to carbon emissions. Instead, a “pre-pay” carbon policy would let the market decide whether it is more economically efficient to transition to non-fossil sources of energy or to pay for removal credits needed to continue using fossil fuels. In this way, a “pre-pay” system would look similar to both an upstream carbon tax and a cap-and-trade system. Finally and best of all, this system would lead to an immediate decarbonization of the economy on net. A “pre-pay” carbon pricing system would have a number of significant challenges to implement. For one, it would require complex border adjustments to imported goods to ensure carbon emissions aren’t simply shuffled internationally. Second, this program would need to be coupled with strong conservation policies to ensure that ecosystems were not purposefully degraded for the purpose of then “restoring” them for carbon removal credits. Third, removal credits – be they biological or geological – would have to be stringently verified for their permanence and sustainability, requiring significant and potentially complex administration (and potentially additional scientific analyses). But the biggest challenge and reason that a “pre-pay” carbon policy will remain purely hypothetical for the near future is the cost of carbon removal approaches. Today, many carbon removal approaches are estimated to cost over $100/ton of carbon removed, which is an order of magnitude greater than other major carbon pricing programs across the world (including the EU and California). What’s more, many carbon removal systems have not been built at commercial scale yet, so it is possible that a “pre-pay” carbon policy would even be technically infeasible to achieve in the near-term. Above: while the estimated scale potential for carbon removal solutions is large, so too are the estimated costs of carbon removal systems. If carbon taxes and cap-and-trade programs continue to languish as politically infeasible, however, we will need some way to efficiently reduce net carbon emission levels. And even if other carbon pricing systems do take off, a complementary “pre-pay” policy could prove beneficial for stimulating early commercial demand for carbon removal solutions. As such, investing today in research and development to lower the cost of carbon removal approaches and to improve the efficiency of monitoring and verification efforts would have an enormous payoff if it led to a politically feasible “pre-pay” carbon policy. In 2014, investors allocated $310B in capital to clean energy projects according to Bloomberg New Energy Finance, making up a significant portion of the ~$1.5T in total global investment in energy supply as estimated by the International Energy Association (“IEA”). What’s more, the IEA predicts we will need over $40T in cumulative energy investment by 2035 to meet energy needs, suggesting that the amount of capital needed to be deployed annually for clean energy projects will have to increase by an order of magnitude over the coming decades to meet the dual goals of preventing climate change and powering the world’s economy. 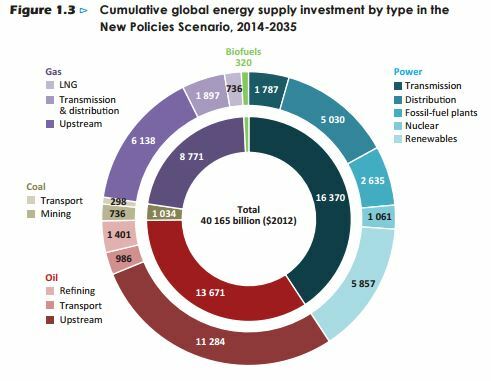 Above: The IEA’s 2014 World Energy Outlook projections for necessary clean energy investment. As the clean energy finance community grows, it also pioneers new ways to finance low-carbon energy projects. The past few years are no exception: publicly-traded yieldcos have flourished, asset-backed securitization has helped reduce cost of capital for distributed generation companies, and public-private partnerships have helped increase clean energy deal flow. These financial innovations that enable low-carbon projects have enormous implications for “negative-carbon” projects that scientists increasingly project we will need but that have only just begun to develop. Low-carbon technologies like energy efficiency and renewable energy have had several decades to de-risk technical, regulatory, and financial barriers, and sit well poised to expand rapidly. Negative-carbon approaches must leverage as much of the experience of low-carbon projects as possible if they are to develop to appropriate scale quickly enough to prevent climate change. Later this month, many low-carbon financial success stories will be on display at the Low Carbon Energy Investor Forum 2015 in downtown San Francisco. I’m excited to be speaking at the event, as the agenda includes conversations on emerging financial innovations, technology developments, and policy support needed to scale low-carbon developments. What is particularly interesting to me about this, however, is that for an event with the words “low carbon” in the title, the word “climate” appears only once on the agenda — for a session titled “Climate Change – The new factor becoming mainstream among investors.” This shows that, with or without an explicit mandate to fight climate change, the financial sector is committing hundreds of billions of dollars to technologies that are pivotal for fighting climate change. And as much as any financial lesson, negative-carbon solutions can learn from low-carbon solutions the power of strong financial business cases in helping to catalyze the growth of negative-carbon solutions, and make these nascent investments today the “mainstream” investments of the future. Want to join the Low Carbon Energy Investor Forum? Use the code “lcei15” for a 15% registration discount. Commercial use of direct air capture machines for fuel synthesis can help pave the way for negative-emission direct air capture and sequestration projects. This news about the air-capture/fuel-synthesis collaboration between Audi and Climeworks is an encouraging sign. Thermochemical conversion of biomass also provides an important route to carbon-removing bioenergy + carbon capture and storage. This project in France led by energy major Total isn’t planning to capture carbon emissions, but the learning from this project will be critical for future efforts that do incorporate capture systems. Bioenergy + surfing for carbon-removing energy systems? Very cool. Providing incentives to restore Grasslands requires measurement and verification protocol, like this one recently released by the Climate Action Reserve. ClimateProgress on the soils and climate change. China’s Great Green Wall projectholds potential for large scale afforestation, but many questions remain unanswered about its long-term impact. 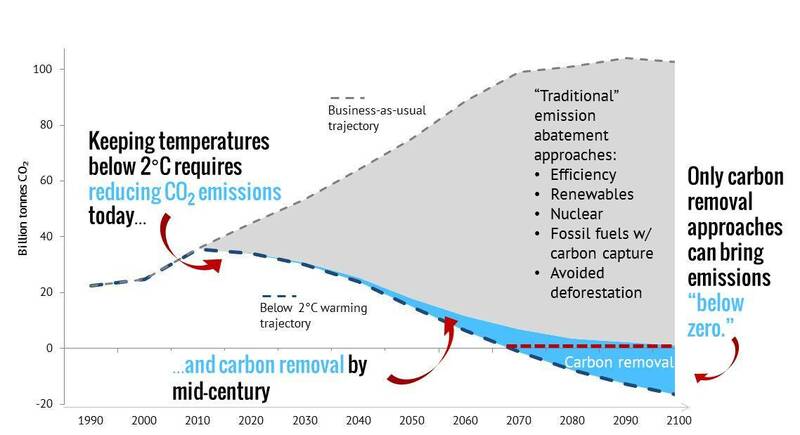 The potential role of carbon removal as a complement/enabler of continued fossil fuel use has the potential to grow highly contentious in coming decades. John DeCicco provides an interesting perspective on this conversation. The environmental advocacy group Greenpeace recently released a report lambasting carbon capture and storage (or “CCS”) as “a false climate solution” that “[i]n no uncertain terms…hurts the climate.” The Greenpeace analysis, however, made a number of assumptions that fit the conventional wisdom surrounding CCS, but when analyzed with greater scrutiny turn out to be deceptively misleading. Misleading Assumption 1: CCS requires that we prolong coal use. Can we have CCS without coal? From a technical point of view, of course. The California Energy Commission just held a workshop on natural gas power generation and CCS, a handful of companies and researchers are working on direct air capture systems that can pull carbon from ambient air, and researchers across the globe have begun thinking about carbon-negative bio-energy and CCS projects. It may be politically infeasible to start developing CCS on these non-coal resources, but a compromise could be to ensure that we phase out coal CCS in favor of non-coal CCS. Regardless, it’s too early to say whether these non-coal (and even renewable!) CCS systems can play a large role in fighting climate change, because we simply have not done enough research and development to have good data on these systems. 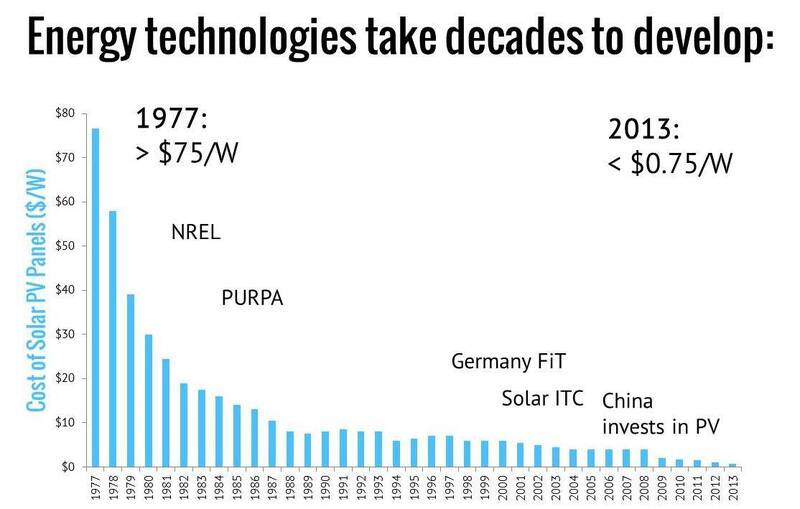 Throwing out renewable CCS today as the unrealistic dreams of “techno-optimists” is analogous to stopping the development of solar energy back in the 1970s because it was over 100 times more expensive than it is today. Misleading Assumption 2: It is inevitable that CCS will lead to increased EOR. Can we do CCS without EOR? Yes. There are a number of demonstration plants across the world injecting CO2 underground that involve no EOR. If we don’t want EOR, we simply need to regulate CCS so that it can be cost-effective without additional fuel production. Such a pathway will increase the cost of CCS, and there is a much more valid and nuanced debate than what the Greenpeace analysis provides on whether we should pursue EOR in combination with CCS that focuses on using EOR as a pathway to net-negative emissions. But if we wanted to assume that EOR was entirely undesirable, we could still have CCS — it would just cost more than it would in conjunction with EOR. Misleading Assumption 3: Underground storage of carbon is required for sequestration. Does carbon have to be stored underground? No. We can turn it into cement, plastics, or any number of other solid products. Will there be issues with storing large volumes of solid carbon above ground? Probably. But we can get around the geologic sequestration problem if we wanted to accomplish this goal. So can CCS hurt the climate if done wrong? Certainly. But is Greenpeace justified in saying that “in no uncertain terms” CCS “hurts the environment?” Certainly not. As a result, I remain unconvinced that we should throw out CCS as a climate solution today. Instead, environmental advocates should strive to make clear all of the potential pitfalls of CCS, and ensure that its development balances these environmental and social concerns with the economic considerations of the companies and regulators responsible for deploying these solutions. If you think coal is bad, fight coal. If you think EOR is bad, fight EOR. If you think geologic sequestration is bad, fight geologic sequestration. But we can make a world where coal, EOR, and geologic sequestration do not exist but where large-scale CCS still flourishes if we so choose. While this world might seem far from reality today, it might be the only world where we can prevent catastrophic climate change, as most renewable energy solutions (like wind, solar, geothermal, etc.) are not capable of generating the net-negative emissions we likely need to prevent climate change. So let’s stop entangling CCS inappropriately with arguments against related energy systems, because we can decouple CCS from these system is we choose. If we keep conflating CCS with these other arguments, we risk throwing out the CCS baby with the coal bathwater.